New - York City County, and Vicinity. 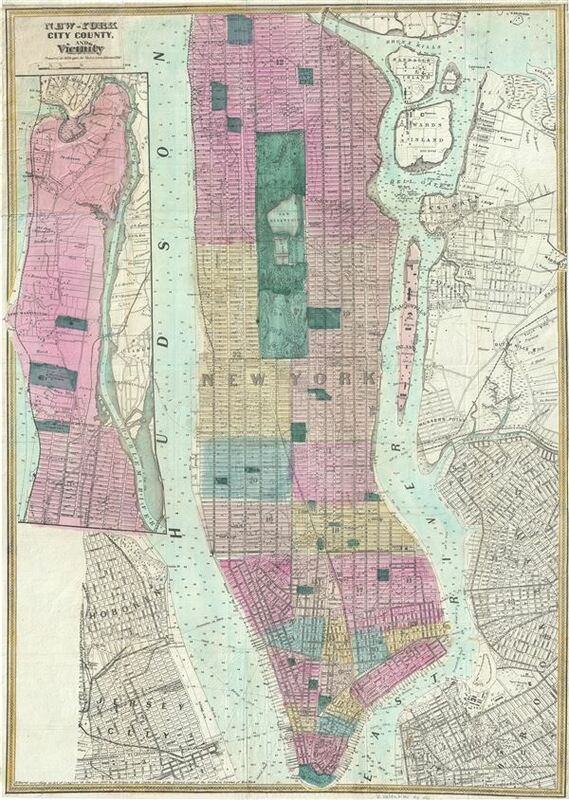 This is a rare 1866 map or plan of New York City by Matthew Dripps. It covers the entire island of Manhattan as well as parts of Brooklyn, Queens, Hoboken and Jersey City. Shows the city in considerable detail with all streets and, in Manhattan, block numbers clearly shown. The northern portion of Manhattan in included in an inset along the left border. The names and tracts of Manhattan's original land owners are superimposed over the grid. Where Columbia University now stands, this map reveals a 19th century Lunatic Asylum. In Queens, Dripps labels Hunters Point and shows the beginnings of the Long Island Railroad. Astoria is well delineated. Central Park is mapped detail exhibiting the fully glory of Olmstead's plan. Dated 1866 under the title, the copyright at the bottom left reads 'Entered according to Act of Congress in the year 1860 by M. Dripps in the Clerk's Office of the District Court for the Southern District of New York.' Prepared by Matthew Dripps for issued in David Valentine's 1866 Manual of the Common Council of New York. Valentine, D., Valentine's Manual of the Corporation of the City of New York, (1866 edition). Very good. Printed on onion skin paper. Original fold lines exhibits some toning and wear. Minor spotting here and there. Professionally flattened and backed with archival tissue for stability.